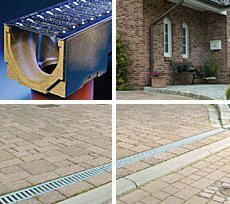 DrainLine 100 is a durable polymer concrete trench drain system for use around residential, office, and other light duty areas. Polymer concrete is a versatile composite material produced by mixing mineral aggregate with a resin binding agent. Polymer concrete outperforms HDPE in its compressive strength, ability to withstand freeze-thaw cycles and adverse weather conditions, ensuring a longer service life. The system offers a number of outlet options with bottom knockouts, choice of outlet caps and in-line catch basin connections to suit 3� & 4� Sewer & Drain and 4� Schedule 40 pipe. Call 800-277-5015 to place your order for Drainline 100!